Welcome to Gramercy Park West. Conveniently located between the new 85 bypass and old I-40/85, this community is a quick commute to Greensboro, Burlington, High Point, Pleasant Garden and other great nearby communities. This particular property in Gramercy Park West has a choice cul-de-sac lot that has a completely fenced in back yard. It's a private oasis you don't expect to find in a subdivision, so you get the best of both worlds. The owners spared no expense with upgrades which include beautifully laid tile work in the foyer leading to the kitchen. The kitchen itself, features beautiful granite countertops, stainless appliances, and a matching tile backsplash. 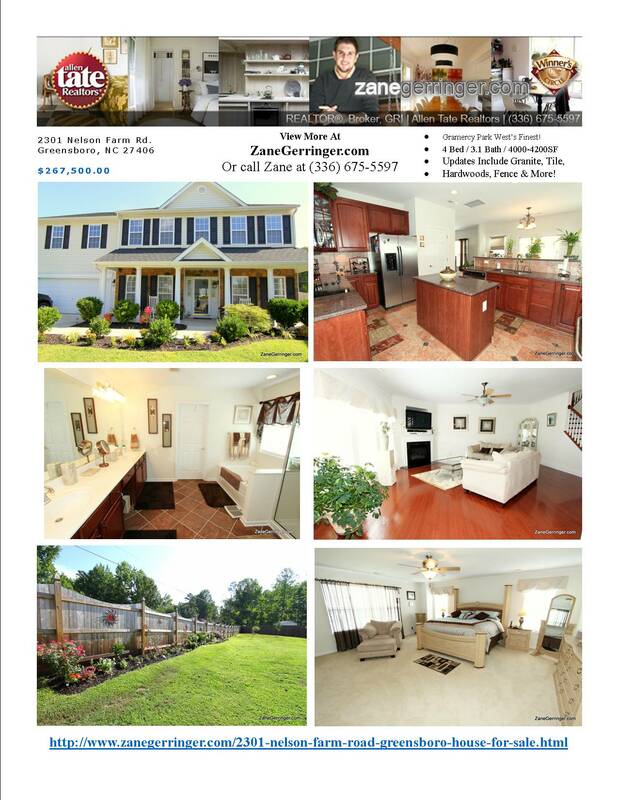 Come see in person the tremendous value offered at 2301 Nelson Farm Road today - call Zane or your Realtor today for a showing! 2301 Nelson Farm Road is an immaculate piece of real estate with all of the bells and whistles. This home is fully loaded with upgrades such as granite, tile, hardwoods, crown molding on both levels, surround sound in the loft, and two master suites! *By Appointment Only - Call Zane or your Realtor for an appointment today! Want More Info On 2301 Nelson Farm Road?